The life of David, king of Israel, is full of paradoxes. He was called in the earliest historical traditions of the Bible, “the sweet psalmist of Israel” and the one chosen “after [God’s] own heart,” yet he is famously summed up elsewhere as the adulterer and murderer “in the matter of Uriah the Hittite.” He was at pains to proclaim his loyalty to the previous and first king of Israel, Saul, and yet he was the ringleader of an insurrectionist group that undermined the government of that same king. He was the boyish, sensitive son of a rural farmer, and he was the warrior who felled the champion of Israel’s nemesis and went on to slaughter “his ten thousands.” It is in the juxtaposition of these images of David that later Jewish and Christian religious traditions find so much contradiction. In historical terms David anchors the Bible in time and space. The theory is that the empire of David really did outshine the other ancient empires of its days, and this historical fact can be demonstrated. Before the narrative of David, the Bible shows the power of stories and myths to persuade and inspire people of later generations, but with David (and his son Solomon) comes external evidence to support biblical reputations and stories. On the other hand, the evidence for the empire of David as described in the Bible is meager. It causes some modern scholars to hold that the idea of a united kingdom of Israel and Judah, founded by David and expanded by Solomon, is exaggerated or idealized. In fact, there is no mention of David in extant contemporary writings, yet there are inscriptions that mention his name within 200 years of his purported life. According to the accounts found in various books of the Bible, David was anointed as king by one of the prophets and Judges, Samuel, who had rejected King Saul. David was the youngest in his family, a mere shepherd, but David was later chosen as a minstrel for the court of King Saul. David’s humble beginning and inauspicious debut before Saul were even more incongruous with his next role as warrior and national savior. He wandered out to a battlefield and was provoked into a duel by the threats of the Philistine champion and giant Goliath. Once David slew the adversary, Saul’s army prevailed. Back in the court, Saul grew ever more jealous of David. David’s charisma grew by the day, and by his exploits he persuaded even Saul’s son and daughter to protect his life. Saul’s jealousy reached the point of conspiracy against his otherwise faithful subject, so David fled into the wilderness for the life of an outlaw. David was on the run constantly. His pursuers cornered him at least three times, but each time he miraculously escaped. He showed magnanimity when he rejected easy opportunities to slay King Saul. Eventually he accepted his lot as an outlaw and recruited a band of other fugitives who took up banditry with him in the Judaean hills. In fact, the Bible portrays him as a kind of Robin Hood who protects his own kinfolk and their livestock, while he harasses those foreign armies who trespass Israel’s lands. The next move took him to the land of Israel’s enemies, the Philistines. Here he took up with a local king who provided him safe haven for his looting and marauding in the area. In return, David committed his band of outlaws to help the Philistines. When his services brought him to fight against his own king and countrymen, the other local Philistine kings refused to accept him. Thus, he was spared the dilemma of killing his own people or killing his foreign hosts. The result of the battle was that Saul took his own life when his army lost. David became king of Judah, his home area, but it was several more years of fighting until he can become king of the northern kingdom of Israel. 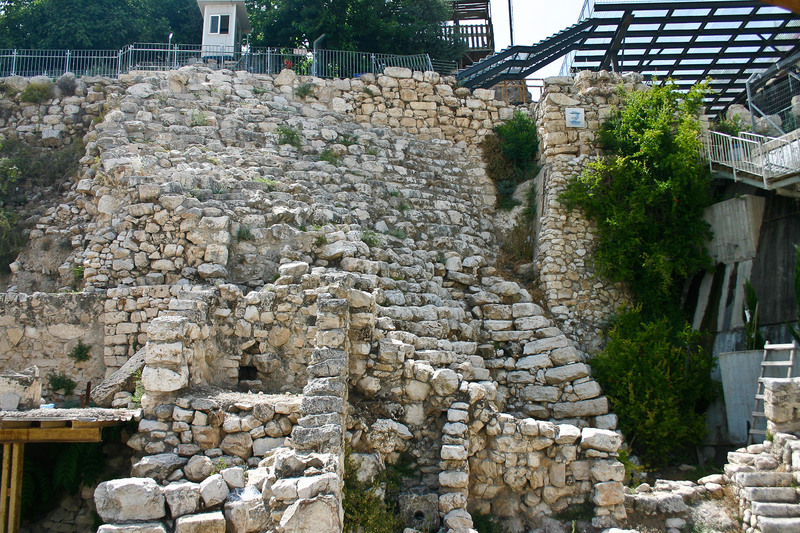 His first base was Hebron, a symbolic place where the Patriarchs’ tombs are located. The war between Saul’s followers and David went on for another two to three years. With the death of Saul’s son and general, the northern region finally succumbed. In a brilliantly wise move David vacated his capital and conquered a city in a neighboring region, renaming this new location Jerusalem, or City of David (not the city favored by Judah or Israel). From Jerusalem the expansion of the kingdom began. By the end of David’s life the empire extended from ancient Egypt to the Euphrates (present day Iraq). He won systematic victories over every army that opposed him. If this description is accurate, it means that for the first time in history, Israel was truly a world power with which to be reckoned. At the same time David showed his religious zeal when he brought the Ark of the Covenant into his capital. A temple was not built until the reign of his son Solomon. However, the Ark tied David to Moses and the covenant elaborated on Mount Sinai and as the most primitive symbol of worship connected David to the cult (temple, sacrifice, and priest). In these otherwise halcyon years the cataclysmic lapse of David’s judgment occurred when he committed adultery with Bathsheba and then tried to cover it up by arranging for the death of her husband, Uriah. As the kingdom expanded, David’s house collapsed. 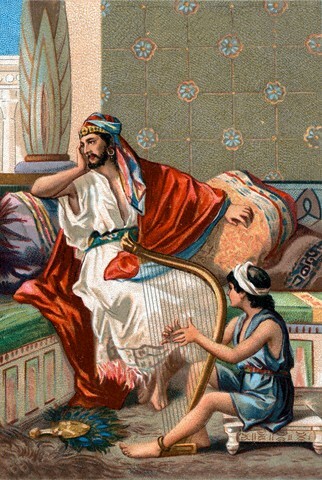 Within a few years the corruption of David’s house caused the unraveling of the kingdom: His daughter Tamar was raped, his son Absalom rebelled and was killed in battle, the northern part of his kingdom (Israel) attempted to secede under Sheba, and finally his two sons Adonijah and Solomon schemed and manipulated David for control of his kingdom.